Sanctuary resident praises new home. One of Cumbernauld’s oldest residents has her second brand new home in the town – more than 50 years after her first. Maureen Sim was the first person to secure a flat in the town’s desirable 1960s tower blocks. Now, over half a century later, the 94-year-old has moved into a low-rise Sanctuary flat in Seafar. Maureen’s 8th floor flat in Berryhill Road’s Graham House was cold and plagued by damp. Her new home in the modern Berryhill Road block will keep Maureen warm this winter. “I never thought I would live to see the original blocks come down. I was the first person to move into Allanfauld Road’s Buchan House, the first high-rise built in Cumbernauld. I later moved to Graham House where I spent 33 years before I moved here in October. Maureen’s flat is in a block of 12 built by Sanctuary in partnership with North Lanarkshire Council and the Scottish Government. 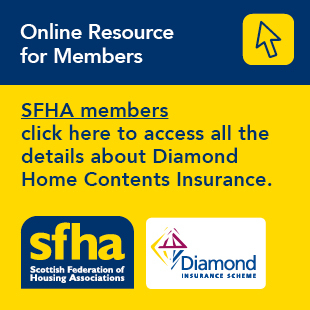 Half the homes are available for social rent; the remaining six have been sold through the Scottish Government’s shared equity scheme. The £1.6 million project is the most recent completion in Sanctuary’s £75 million regeneration of Cumbernauld’s 12 high-rise blocks. A £1 million Scottish Government grant made the project possible.